Barrel Select Chesapeakes (BSC) is a breeder located in eastern Connecticut. 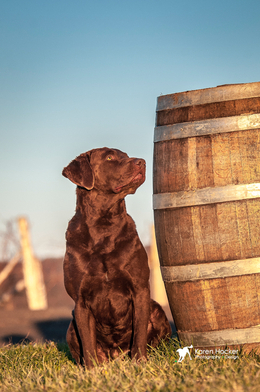 Owners, Todd and Cassia are honored to be a part of the oldest American breed. 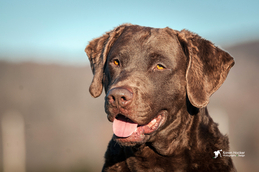 We are determined to not only breed sound Chesapeake Bay Retrievers, but to continue to add value and improve the wonderful foundation pedigrees started over a century ago. Our breeding plans of 1 to 2 litters a year (with some years off), allows us to dedicate our time to training and working our dogs. We are breeder-owner-handlers and participate in hunt tests and conformation, as well as dabbling in obedience, nosework, tracking, and field trials. We believe that a true Chesapeake should not only be conformationally correct and have a sound temperament, but should be able to perform and work as they were originally intended to do. BSC will only breed dogs that demonstrate their conformance with the breed standard and their ability to perform whether it is in hunt tests, obedience, tracking, agility, search and rescue, etc. Cassia’s career as a professional dog trainer and behaviorist has been focused for years in animal behavior which has provided substantial experience and a solid foundation in canine behavior and developmental learning. We both feel that the temperament of any dog is just as important as the structural and working attributes. Cassia's experience provides for the best environment for BSC dogs as they share our house and lives, and provides an environment geared for raising litters in our home. Todd, Cassia, and family, are all avid outdoorsmen and hunters. Whether it be waterfowl or upland hunting, our dogs are with us hunting side by side, doing what we all love to do. Additionally, we are active in the AKC, are members of The American Chesapeake Club (ACC), Yankee Waterfowlers Hunting Retriever Club, and the Chesapeake Bay Retriever Club of New England. We have been fortunate to work with excellent and experienced breeders when acquiring our foundation stock; these breeders continue to support and mentor us today and we are thankful to have their guidance, support, and input! Please feel free to contact us for additional information or questions you may have.